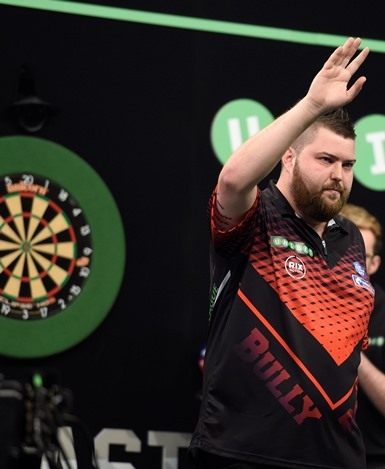 Gary Anderson and Michael Smith both tasted success as the Premier League hit Belfast. For Smith, it is a 6th win so far and a semi-final appearance is very much within his grasp. His 7-2 win over Gerwyn Price means the Welshman is eliminated from the competition, but Smith stays second in the table hot on the heels of leader Michael van Gerwen. “I wasn’t really at my best but I keep getting away with it and I haven’t yet played anywhere near my best. Hopefully that’s to come now we are getting to the business end,” Smith said. And it’s now three wins on the spin for a rejuvenated Anderson as his bid to reach the top four gathers pace. A crucial 7-5 victory over Mensur Suljovic to strengthen the Scot’s position. “It has taken me a bit of time to get things going this year in the Premier League. My scoring was a bit iffy but in the main, my finishing was spot on,” he said. He started with a break of throw in the very first leg. A 74 check-out followed by an 82 finish to double his lead. Suljovic though hit back with finishes of 77 and 101 then a 12 darter to level at three apiece. But Gary edged ahead again and then came the turning point as the Unicorn star banged in a brilliant 124 on the bull to break throw for a 5-3 lead. Suljovic has one dart to break back but Anderson wasn’t to be denied and after missing the bull for a 7-4 win, he nailed D9 in the next leg to get the job done. Smith took advantage of a well below-par Price who has found his debut season in the PL to be a real struggle, as the Unicorn man did two years ago. The Welshman actually broke throw in the opening leg and then missed darts to win the next two legs. Smith was patient and poised and a superb 160 finish was one of the highlights of the night. He just keeps going about his business and he keeps winning! Smith looks ready to win a first big TV title. Elsewhere, Michael van Gerwen won the all Dutch battle against Raymond van Barneveld. From 2-2 the defending PL champion won five straight legs to coast past the winning post. Hometown hero Daryl Gurney thrilled the Belfast crowd after he fought back to beat World Champion Rob Cross 7-5. Gurney hit NINE 180s! And Peter Wright battle back to earn a draw with Simon Whitlock after the Aussie missed one match dart. That point could be priceless as Wright bids to avoid elimination on Judgement Night in Liverpool next week.